Not always the same topics but always fun! 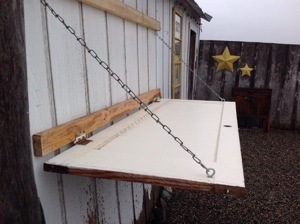 Well I wouldn’t exactly call this a tutorial but here is how I built a fold down bar in my garden out of an old door. I had this old door hanging out in shed from when we removed it in my kitchen. It took four large eye bolts long enough to go through my door, some washers, four locking nuts, enough chain to hold the door up on both sides ( you will need to measure this based on your door width)’ three 2x4s, a 1×2 some 2in screws and a drill. 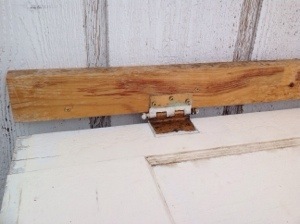 I reused the hinges off the door. My shed I was hanging the door on wasn’t very thick walled and I didn’t want my door falling off so I used a 2×4 on the inside for something solid to screw the hinges into. I did the same with the 1×2 where the eye bolts to hold the chain were going to come through. Again the distance between these two boards will depend on the width of your door but should be equal to the width. I put a 2×4 on the outside to mount the hinges to. I also put one the same distance as the width of the door on the outside, so when closed my door would lay flush. 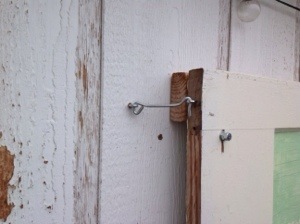 Next I attached the eye bolts to both the shed and the door. I drilled out the door to insert these. I used the washers and locking nuts to hold them in place. Make sure to offset the a little or your door won’t close. 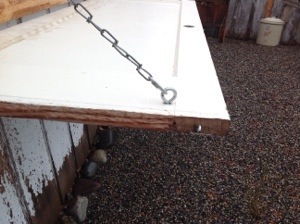 I attached the chain and adjusted so when open the door hung level. I also took the inside knob off since it hit and wouldn’t let the door close right. I put a hook and eye on each end to keep the door closed when not in use. Hope it gives you some ideas! 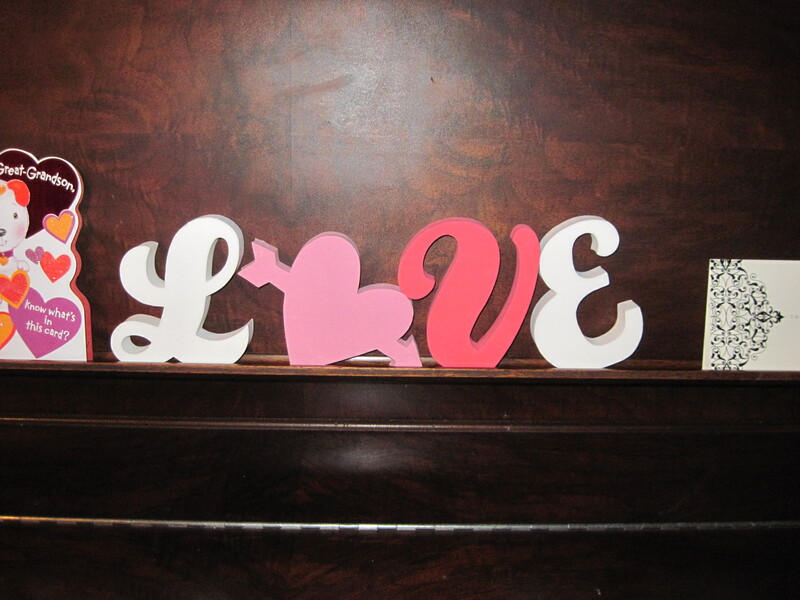 I made this last year when I discovered I didn’t have anything for Valentine’s to hang on my picket fence. I change it seasonally and I wanted something for V-Day. 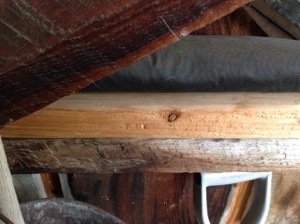 I found this great piece of barn wood in a pile I keep behind my shed much to my husband’s chagrin. I took the cheap foam letters pictured below that I got sevearl years ago and traced them onto newspaper. 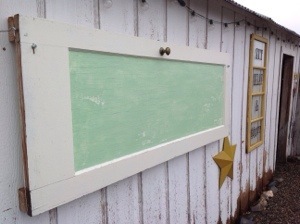 I then cut out the letters leaving a stencil and taped it on the barn wood. I then lightly sprayed over top with a deep red spray paint I had on had. I liked the imperfect light coating. It made the sign look old. I peeled the newspaper off, let it dry and added a hanger on the back. TADA! Happy Valentine’s Day! it has taken me longer to get this tutorial up than to make this project. My son loves to lay down on the floor with a pillow and is getting big enough to not need his pack and play for nap times at daycare. I made him this special pad with removable foam so its washable. I used fabric I had hoarded up for a while and some old jeans of my husbands. The only expense was the foam inside. We typically put my yoga mat in the bottom of the pack and play for overnight trips to soften up the bed a little without the risk of something to fluffy. The yoga mats work excellent but were almost $20. Being the frugal mom I am I shopped around and settled on a foam mat designed for camping for only $10. I have enough left over to even line the new baby’s bassinet. I made my mat 36 x 25 to fit in the pack and play but you could adjust the size to meet the needs of your child. 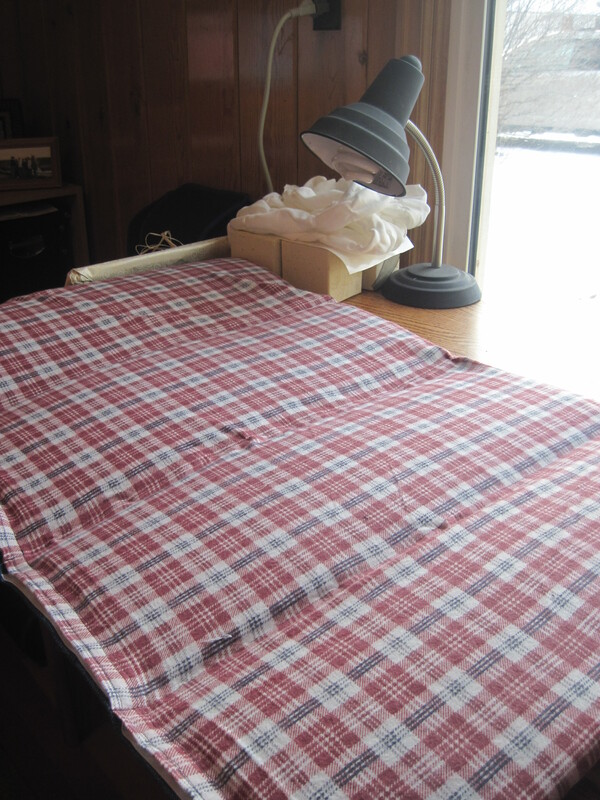 Step 1: Cut your fabric, both top and bottom, to the size you would like your mat to be. Again mine is the size of my pack and play. I used scrap denim so I sewed the large pieces from my husbands pant legs together until I had a square large enough to cut out. Step 2: Sew a hem in the right side of both your top and bottom fabric. This hem should be as deep as your velcro. This is the “open” side of your mat where you can pull the pads in and out. Step 3: Sew your velcro on the hemmed edge. Take the length of the mat, divide by 4. This amount will be how big each section of your mat will be. You need to subtract 2 inches and cut your velcro that size. So if your mat is 36 inches like mine your sections will be 9 inches. You only need to make your velcro 7 inches long for each section. You need 4 male and female pieces this long. 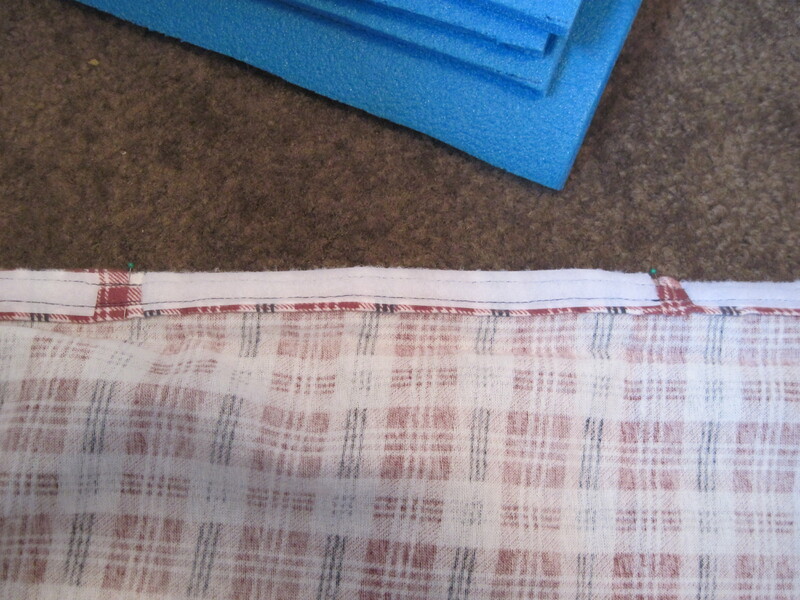 Step 4: Turn your fabrics right side to right side and sew along the three edges that are not hemmed. Turn right side out. Step 5: Now mark, I used pins, on the right side of your mat ( Right now looking like a giant pillow case) at each of your section marks. In my example above this would be every 9 inches. This is where you will sew a stitch parallel to the top and bottom from velcro side to closed side to make 4 pockets for the foam. Step 6: Cut your foam pieces the width of your mat and about 1 inch smaller than your section size. In my example this would be 8 inches. You might need to do some trimming to make sure they fit and fold in your mat. This will vary with your mat thickness. I had to do a little trimming to make them fit. Slip your foam in, close your velcro and TADA! Most normal pregnant women wash their lines or clean behind the refrigerator when the nesting instinct kicks in. I pull up the carpet and refinish the original 80 year old wood floor. In my attempt to lessen the financial burden of Christmas this year I decided to make homemade gifts. This did help alleviate the cost but it also added to my work load when I sat down with my list and figured how many gifts I needed to make. This being said however I found a few cool things to make from the heart and on the cheap. Here is one of the projects. All in all it only cost me about $6 to make each one of these. I used this tutorial to make the hems on my scarves. TIPS: The Ban roll is found at a sewing center focused on clothing or tailoring. I had to order it online, it wasn’t at Micheals or JoAnns. Also I suggest just doing a test run on a piece of cotton to see how it works. I didn’t get it at first until I tried it and then it was awesome. Also I used a paperclip to keep the loose end of my roll in check. The earlier tutorial recommends buying a longer piece to use for bigger projects bu the excess tail was driving me nuts. Step 1: Cut the silk into a 36×36 square. This is easiest done by folding up a corner as shown below. Step 3: Follow the tutorial linked above to make your first hem stitch on one edge. Remember to pin on the right side of the fabric first. This was the hardest part for me. I couldn’t get my head around starting on the right side. TIP: I put a heavy cotton pillowcase under my machine. This gave me a less slick surface to work on since the silk slides around a lot when pinning and sewing. It also helped because I could just slide the machine up and iron without having to get up to press hems. A major bonus when you are making 11 of these. Step 4: Keeping using the baby hem all around the four edges of the scarf. This hem helps make a neat little corner also. And you’re all done! If you’ve ever been to a walmart and ended up with a little one that needs diaper change you understand the value of having something clean and sanitary to lay your little one on to change a quick diaper. This travel pad is modeled after one given to me at my baby shower for my first baby. I have used it so many times I need to sew up a new one for the next baby. From saving my seat cushions in the car from a major blow out to keeping my little one separate from less than clean surface this has been a baby must have. I have sewn two more for family and their new arrivals. They are quick and easy to whip up. This pad measures 12 x 24. It folds into a handy size to fit in a diaper bag and will fit even my large 18 month old for a diaper change. The lower (pictured in brown) section is large enough to fit a huggies travel wipe case that comes in t he big box from costco but there is room to adjust here. Step 2: Pin the male velcro ( the grabby side) to the right side of the cotton rectangle in the center and about 5 inches from the bottom. Sew it in place. You can round the edges of the velcro to keep in kid friendly. Step 3: Pin the female velcro ( the soft side) centered in the top of the PUL. Sew it in place. Step 4: Pin the PUL and cotton right side to right side. Do not pint he bottom of the two fabrics. Step 6: Turn right side out and press. Step 7: Cut out a 13 x 26 rectangle in the cotton or coordinating color. Step 8: Fold over and hem both the “long” sides of the fabric. Fold in half to form a large pocket. I like to slide my wipes case in and pin along the edge at this point. Then I know it will fit. Stitch along the pin line forming two pockets. 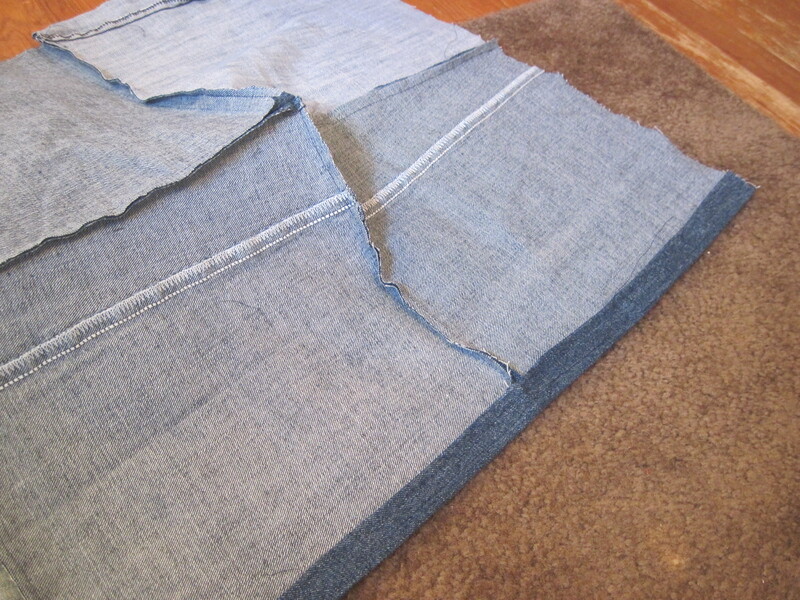 Step 9: Insert the raw edge of your “pockets” in to the open end of the pad. Top stitch along the edges securing the pockets. I started out wanting to make something in mass for 11 families on my Christmas list. A friend of mine shared a gift she had gotten that was block with a saying for each season. I misinterpreted the description and ended up with these. Apparently the one she was relating to me was the cute blocks so popular on pintrest right now. Well, I wanted to be different right? 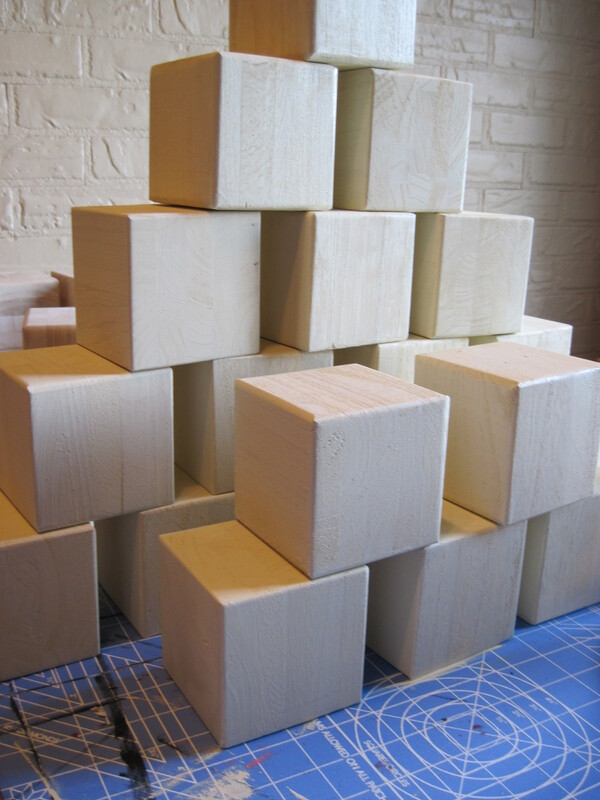 I started by painting my blocks with the base coat. I used white on white so using my large brush I painted four sides, leaving the “top” and”bottom” unpainted so I had s surface to hold on to and let the block dry. I then painted the remaining two sides when it dried. Since this was just a cover coat I didn’t worry too much about great coverage. I then painted the four sides with crackle medium. This takes a lot longer to dry. I used crackle to help build dimension on the block since no fun 3d accessories can be added to the blocks. They have to lay flat to rotate to the next season. I then “crackled” the top and bottom. After this was all dry I covered the blocks in the two step mentioned above with the white again. You could use a contrasting color on the second coat to add more dimension and more noticeable crackle. After these two coats dried I then sanded down all edges. I then used my vinyl cutter to print letters. You could paint your own, or use stickers. I just had 11 sets to finish so I opted for a quick mass production option. 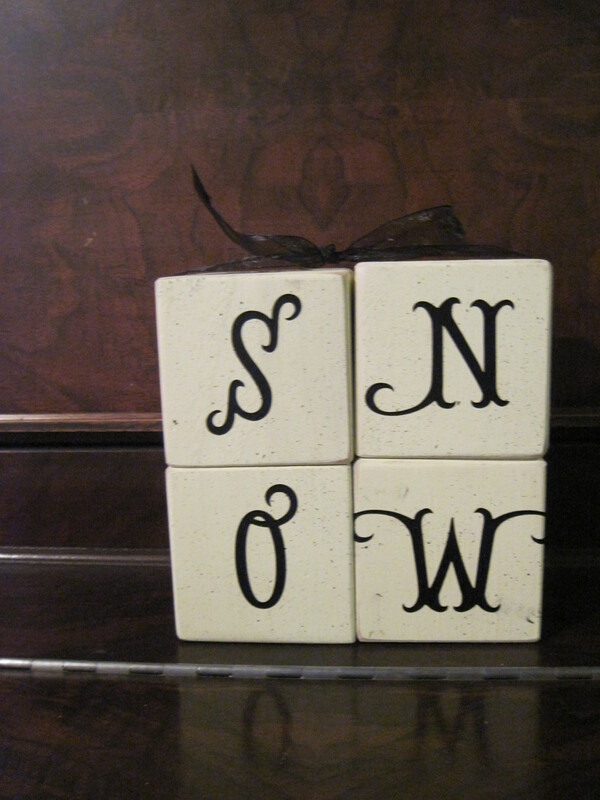 For Winter I had “S” “N””O””W” on the four blocks. I tipped them up exposing a new side and put “G” “R” “O” “W” on that side of the set for Spring. 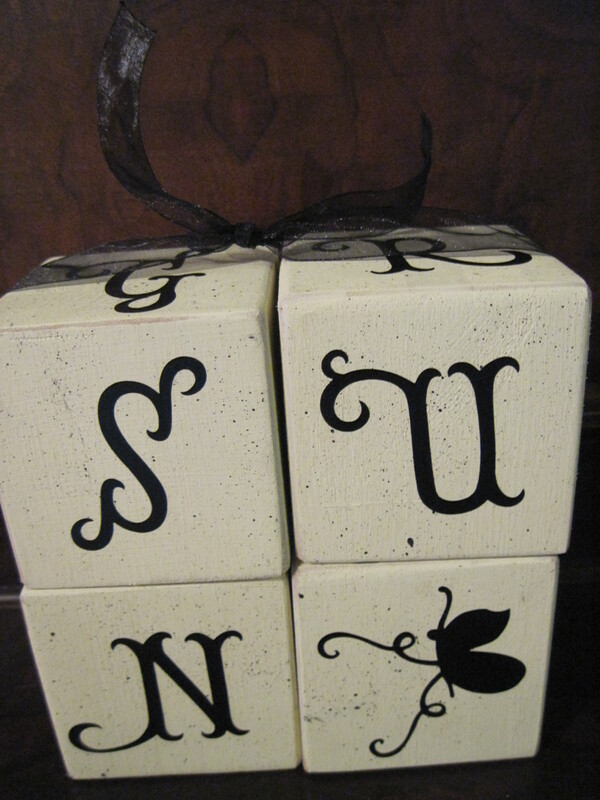 I flipped the blocks again and put “S” “U” “N” and a cute butterfly for Summer. As a side note it is extremely difficult to find a 4 letter word to describe summer 🙂 I flipped the blocks for the last time and put “F” “A” “L” “L” for Fall of course. I tied them all up with a ribbon and put it in a gift bag. All in all, with a great two for one deal on blocks each set cost me about $12.